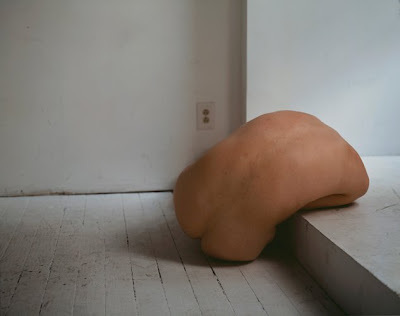 Merge gallery let me in on how excited they are to introduce the work of Bill Durgin in his first solo exhibition with the gallery entitled "Figurations." Durgin's work will be on display opening September 4, 2008 to close October , 2008. Durgin is a New York-based photographer and his current series explores the body in a truly original framework. Durgin's photographs are a reflection of his fascination with the body as a sculptural entity and not as a sensationalized object. His complex arrangements of the figure often require extreme contortion to achieve this austere effect, as if the veracity of his figures has been abstracted.Durgin's photos relate a symbiotic relationship between the models and the photographer. His images do not exploit, instead they explore the limits of our physical bodies and our capacity to accept the human form as just that, a form. The figural gestures within each of Durgin's photographs examine his own physical limitations as well as those of the dancers and performers he works with. The poses in each photo require a tremendous level of skill to reach and maintain. These poses are not only impressive in their ability to seemingly defy physical limitations but they also transform the body into a foreign and amorphic figuration. While the figures are recognizable as bodies they remain detached from common perceptions of the human body. Upon first glance, Durgin's photos possess a certain ominous and disturbing quality, the figures are slightly grotesque but only as much as one of Lucien Freud's figure studies. And in the context of the photo there is a certain architectural quality to the work. The composition is carefully considered and the colors range from light and airy to slightly moodier and grim. What remains though is the beauty of the figure and the mystery behind it. It appears as though Durgin has molded a sculpture out of flesh and then captured it at such an angle that it appears to be missing all appendages and defining human qualities. The effect can be haunting but is also captivating and stunning. 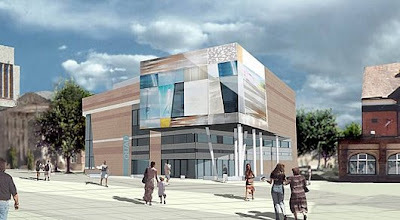 Quad, the new landmark arts centre in the heart of Derby,UK, is due to open on Friday 26th September. One of several new venues opening up in the East Midlands, Quad will play a key role in developing the areas profile. The building, which cost £11.2 million to design and build, brings together two previous organisations, Q Arts and Metro Cinema, creating a new venue of local, national and international significance. Quad will house, for the first time out of London, the BFI Mediatheque, a digital jukebox that gives viewers access to over 1000 films and television programmes. Included in the building is a large contemporary art gallery, two cinema screens, cafe bar, workshop spaces, artists’ studios and The Box, a space for live performances, seminars and film screenings. Internationally acclaimed artists Jane and Louise Wilson are the first commissioned exhibitors, creating an installation which draws on Derby’s industrial and cultural history. The opening of Quad coincides with Derby Feste, with performances and shows running from 26 – 28 September, and Cultural Olympiad, a four year National programme of cultural activity running until 2012. 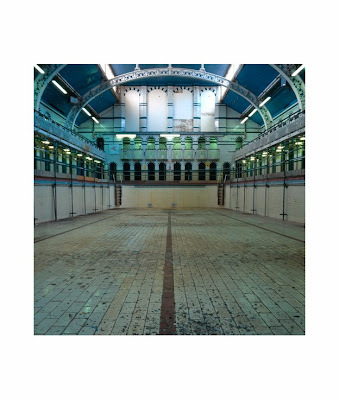 In keeping with the water theme that sounds to be going on around here today, I have also posted some rather nice work from Italian born, London based photographer, Gigi Cifali.The work is entitled Absence of Water. 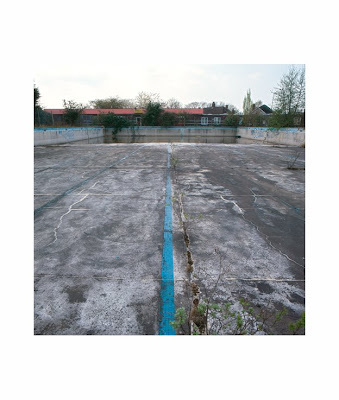 "Three years ago I started a project depicts the disappearance of the old swimming pools and baths in UK. 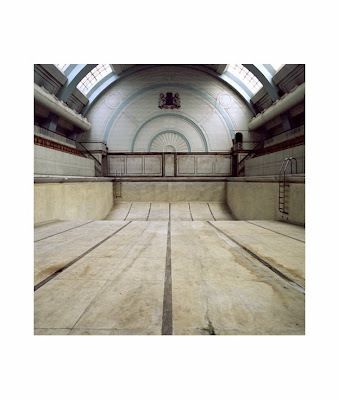 In the Thirties United Kingdom' s baths and outdoors pools were at the peak of their popularity. Gradually tastes and necessities have changed, resulting in a drop in attendances,leaving the pools uneconomical to run. Many fell into decay and many were demolished. Only a handful of pools remain today as a symbol of a bygone era." He also kindly sent me a poem to accompany the images. Make of it what you will. I myself, feel the need to take a swim! thoughts of a citizen who is looking for his local swimming baths. behind this is the simple but magical contact with water. Plunging into the amniotic fluids of secure liberty. Here, every man needs to take a dip. 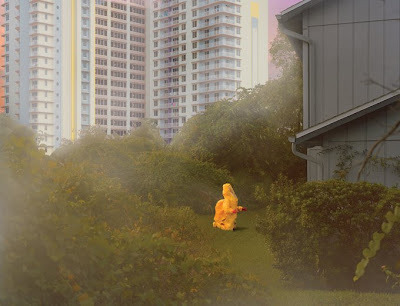 Rona Chang recently submitted her project, Hold Over Water for my consideration. 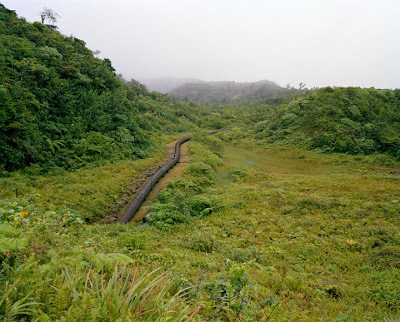 It is a creative enquiry that does well to confront one of the most pertinent issues of our time: water and its management through a set of visually interesting photographs that hinge on the interplay of manmade and natural elements to create their effect. Born in Taiwan in 1978, she spent her childhood on the overcrowded island that is well aware of its limited natural resources, particularly water. She grew up fishing with her dad at man-made fishing ponds, going to dams as recreational areas, and living in an area affected by devastating floods from summer typhoons. 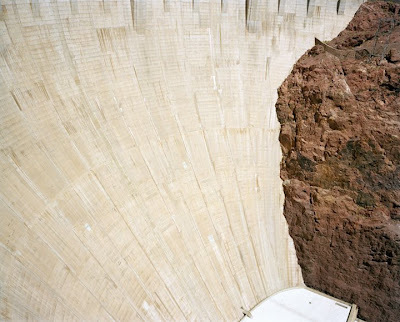 Aware of the many water issues, she began making photographs of parched river-beds and dams in 1999. 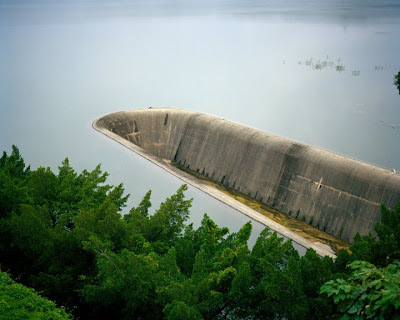 "I am impressed by the sheer volume of water that a dam can hold, the seeming void downstream, and the long geometric curve that can make up a dam's form. The idea of humans engineering their landscapes to alter river courses and the flow of nature has always held me in awe. The images that comprise this body of work speak of my fascination with the temporary power man can hold over water." Rona has a BFA from The Cooper Union for the Advancement of Science and Art, New York, NY, 2000 and has participated in numerous exhibtions across the globe. She also stakes claim to an impressive list of awards, residencies, fellowships and publications more of which can be seen here. The first major exhibition of Olafur Eliasson´s work in Spain has recently opened at Fundació Joan Miró and any self-respecting culture vulture should not pass up on this unique opportunity to check it out. The Nature of Things, as this exhibition is called, exemplifies his creative output from 1993 to the present and amasses a total of 50 artworks, including several new pieces that were specifically commissioned for this show. Encompassing sculpture, photography and large-scale installation, Eliasson explores light, colour and space to create optical effects while always foregrounding the sensory experience of the work itself. Nimbly intersecting art with science he draws our attention to natural phenomena by physically immersing the viewer in the work, the most famous example of this of course being his groundbreaking project, The Weather Project for which he generated a spectacular artificial sunset complete with tangible elements such as steam and heat in the Turbine Hall of London´s Tate Modern in 2003. A similar visceral reaction is sparked to heighten one´s experience of the everyday here at the Barcelona exhibition via Who is Afraid (2004). 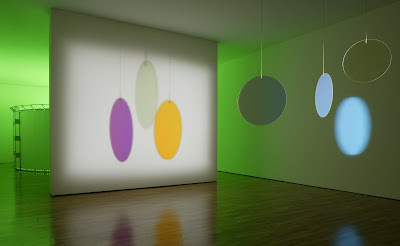 Suspended from the ceiling are three dichromatic glass discs of various sizes which rotate randomly at different speeds, each is of a primary colour: cyan, magenta or yellow. 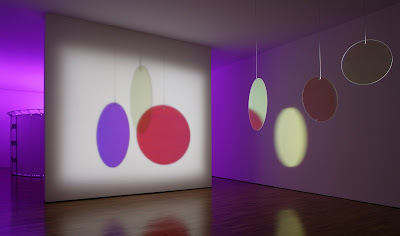 A spotlight shines light onto the discs, some of which is reflected off their surfaces in complimentary colours, while some passes through them to form a seductive coloured projection of the wall opposite. There comes a beautiful moment when the shifting shapes magically align in perfect symmetry, with each of the colour circles overlapping the next in equal measure, thus creating the additive primary colours red, green and blue. It is of the kind of wonderfully inventive and impressive stuff that courts private applause, deceptively simple in its construction yet bedazzling to behold. I recently got wind of theprintspace and decided to check it out whilst I was doing the rounds in Shoreditch, east London. Launched in October 2007, theprintspace occupies two floors of a 4000sq foot area comprising of exhibition space, retouching booths, walk-in print stations and large format digital C-type and Epson Giclée printers. The concept gives photographers, graphic designers and artists the ability to come and produce their own professional prints on the highest specification digital equipment by using retouching booths with the latest professional Mac Pro’s and imaging software. With the rise of digital technologies and the increasing affordability of closed-loop home printing systems, professional printing labs have found the struggle to innovate and adapt their services a principal challenge. Sadly, these changes and the pressures they have exerted on the industry have meant that many professional printing labs in the city have had to shrink with demand, or face closure. In a bold step towards revitalising the conventional approach to top-end printing, theprintspace is the first ‘DIY’ printing lab in London. The ethos at theprintspace is to give creative control back to individuals, whilst giving them the access to the kind of high-end equipment which currently only the most successful photographic and creative companies can afford. The workhorse of theprintspace’s digital C-types is a ‘Chromira’, which is a professional quality, colour-managed, high resolution print device producing exhibition quality archival prints suitable for the professional art market on Fuji Crystal Archive & Kodak Professional paper. The machine prints up to 30'' wide, and up to 50 metres long. Alternatively, Epson (inkjet) prints are from the recently released 880 range using Epson's new Vivid Magenta inkset, exclusive to the range. These 'Giclee' prints are printed on professional art papers, such as Hanhemuhle Photorag, Pearl, and Epson Gloss and Semi-gloss. The Epson prints up to 60'' wide by 30 metres long. By incorporating the same professional standard of colour profiling into a user-driven ‘creative process’, theprintspace negotiates the prolab’s biggest problem – offering the standard of services professional photographers have come to expect, but making it accessible for more than a select few. The result - quality is of the highest standard, but the prices are really affordable, costing as little as £6.50 for a 12” by 16” digital C-type print, and £12 per hour for a cutting-edge, colour managed ‘DIY’ retouching booth. Theprintspace certainly seems to be enjoying the acclaim from both industry professionals and clients alike and rather unsurprisingly has already established a excellent professional photographer client base. They boast an original approach and an ethos based on nourishing the integrity of the visual artist / photographer by offering complete control over the printing process. If you add to that the affordability of their service which allows emerging artists to print to an incredibly high standard, that would otherwise only be the province of highly established artist, I could not recommend a better print lab than theprintspace. Bond Street Gallery in Brooklyn, New York will be hosting Young Curators, New Ideas, a group exhibition organized by Amani Olu and curated by Alana Celii & Grant Willing (Fjord Photo), Michael Bühler-Rose, Jon Feinstein (Humble Arts Foundation), Laurel Ptak (I Heart Photograph), Amy Stein (amysteinphoto.blogspot.com), and Lumi Tan (Why + Wherefore). Reading from the press literature, the exhibition examines different trends and perspectives in contemporary art photography through the bias of six new and seasoned curators. Each curator (or curatorial group), using roughly ten feet of space, aims to engage viewers in a discussion on where he or she believes art photography is today. Völuspá, curated by Grant Willing and Alana Celii, focuses on the themes of magic, otherworldliness, secrets and nostalgia. The exhibiting photographers were curated from the Fjord collective, and include Mikaylah Bowman, Gerald Edwards III, Bryan Lear, Miranda Lehman, Seth Lower, Mark McKnight, Erin Jane Nelson, and Jesper Ulvelius. The images from these eight artists represent the ideas of a multi-verse, which is a self-contained, separate reality. All of the photographs point to a place or moment that feels familiar, but objectively is known to rarely exist. These spurious emotions allow the viewers to address a personal memory or follow one's spiritual quest; yet when presented with the facts that directly make up the photographs, they feel like something that cannot be experienced. Artist Michael Bühler-Rose presents Opposing Photographers by Charles Benton. Benton's work examines the nature of portraiture by returning fine art photography to its roots in conceptual art practice. Benton enables the viewer to be placed within the middle of a photographic "volley" to experience not just the gaze of the photographer towards his or her subject, but also to reflect that gaze back and enable the viewer to experience both subject and object simultaneously. Through this lo-tech presentation Benton reassess the slide presentation/photographic document's traditional function of "pointing to..." and enables the viewer to experience being pointed at. In Jon Feinstein’s exhibition, Light and Color, he explores notions of science, mysticism, astronomy and the unreal using photographs from Hannah Whitaker, Talia Chetrit, Noel Rodo-Vankuelen, and Ann Woo. Much of the work utilizes stripped down elements such as prisms, rainbows, and seemingly banal sunsets to investigate common themes in art history and larger conceptual issues surrounding the process of image making. Laurel Ptak's exhibition takes the show in a different direction by commissioning 26 photographers, designers, and new media artists to embrace the animated GIF. Appropriately titled Graphics Interchange Format, the show explores how a lo-fi digital image technology invented in 1987 fares in contemporary context. 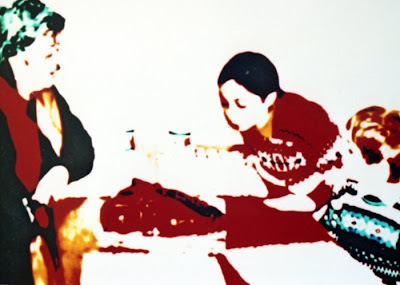 Ptak gave artists only 3 days to complete the commission and encouraged the use of photographic materials. A few of the artists had never made an animated GIF before, while others were notorious for it. "Some use the form epically," says Ptak, "like a novelist or film director; others are self-reflective about the limits of technology and representation; many challenge photography's usual atemporal disposition; and then some just make me giggle." The results are 67 artist-made animated GIFs shown on 44-inch flat screen in an infinite loop. Each are sold in an unlimited edition for $20, accompanied by a personalized note from the artist. Graphics Interchange Format features works by Victor Boullet, Tyler Coburn, Petra Cortright, C. Coy, Daniel Everett, Thobias Fäldt & Per Englund, Martin Fengel, Jason Fulford, Nicholas Grider, Pierre Hourquet, Konst & Teknik, Eke Kriek, Emily Larned, Matt MacFarland, Katja Mater, Kelci McIntosh, Ilia Ovechkin, Robert Overweg, M. River, Noel Rodo-Vankeulen, Asha Schechter, Trevor Shimizu, Jo-ey Tang, Anne De Vries, Karly Wildenhaus and Damon Zucconi. In her exhibition, photographer and critic, Amy Stein, selects five photographers working in the tradition of Cindy Sherman, Ralph Eugene Meatyard and Gregory Crewdson. Featuring Alison Brady, Olga Cafiero, Alix Smith, Alex Prager, and Ofer Wolberger, these photographers employ directorial image making strategies to explore identity and representation of the self. Whether they are directing loved ones, friends or relative strangers, these five photographers bring us lush, evocative cinematic moments that transport the viewer into a space that is alternately unsettling yet strangely familiar. 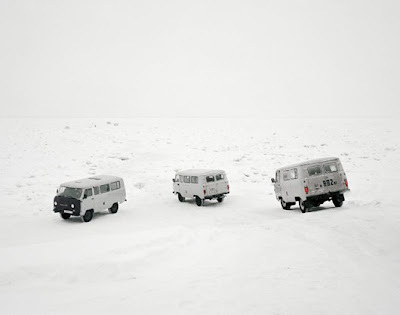 Writer and curator, Lumi Tan, presents three photographs from Brian Bress. In these photographs, Bress conflates the space around us, leaving the viewer disorientated and distracted by a certain distorted familiarity. His use of ordinary objects in seemingly chance combinations and chaotic arrangements are uncanny, asking to be decoded but simultaneously resisting interpretation. By engaging the viewer in absurd performative exploration, he points out how easily we are lost in our own cultural detritus. Get thee to New York. The National Media Museum has recently announced its second Annual Bursary Awards for photographic projects, following the success of the 2007 scheme. The granted awards will be portioned from a total of £20,000 and ensures that the Museums ongoing commitment to emerging talented photographers continues. The bursary is made possible by The National Media Museum in partnership with Michael G Wilson (Chairman of the Trustees of the National Media Museum), Zelda Cheatle (WMG Photography Advisor and Curator), Simon Crocker (Chairman of The John Kobal Foundation), Pierre Brahm (Chairman of the BRAHM and Henry & James Property Group) and Philippe Garner (International Head of Photography, Christie’s Auction House). Applicants must submit a brief written synopsis of their proposal, a c.v, an example of their work and the application form. Applications are invited from all nationalities providing that they are resident in the UK at the time of the award. Successful projects must be completed within one year of the award being given and the photographer is expected to work independently but will receive guidance and support from museum staff if required. Upon completion of the project, an edition or series must be donated to the National Media Museum. For further information, conditions and application forms applicants click here. Rachel Graves is a photographer based in Nottingham, UK. She is a founding member of Unseen, a collective of young contemporary photographers. A recent graduate from the photography degree course at Nottingham Trent University, Rachel uses a variety of lens based media to produce highly conceptual work. She is currently involved in the long term realisation of Fragments, but is also engaged in employing the ability of the portrait to provide us with the time and space to look closely at that which may not be clearly visible in every day life. 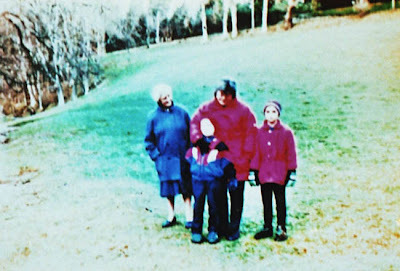 "Fragments is a meditation on the peculiar relationship between family photographs and memory; the role we expect these photographs to fulfil and the trust we place in them to preserve the intimate moments of our lives for future reference. 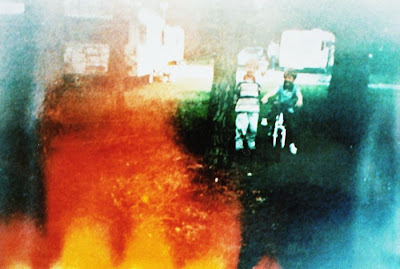 In the production of Fragments I work directly with my family's archive of photographs - every single image including home videos and slides, rephotographing and revisiting each one until it is so far removed from the reality of the moment it once depicted it has become an entirely separate entity." Rachel's also got quite a cool blog which can be found here.